The growth and destiny of the Red River Settlement, from its primitive birth - a small, temporary stockaded fort erected by Pierre de la Verendrye in 1738 at the junction of the Red and Assiniboine Rivers for the purpose of exploiting the potentially rich fur trade - to a modern metropolis of some 600,000 persons, success has been irretrievably linked to these two capricious meandering prairie rivers. Only the courage and tenacity of the early settlers and their successors permitted the settlement to survive and flourish, despite drought, famine, pestilence, disease, blizzards and floods. Less hardy souls would have been inclined to "throw in the towel", fleeing to the sanctuary of a safer, more comfortable life in their land of origin. Had they done so, the fledgling settlement would have returned to prairie grass and dust, severely limiting further colonization of Canada's west. Perhaps the most devastating of nature's arsenal of weapons to plague the valley region has been the occurrence of intermittent flooding. The watersheds of the Red and Assiniboine rivers extend over 110,000 square miles, draining large portions of northern Minnesota and North Dakota, southern Saskatchewan and Manitoba into Lake Winnipeg and ultimately, the Nelson River system. This watershed was the rough equivalent of Lord Selkirk's 1812 Grant of Assiniboia. Assiniboine and Saulteaux natives recounted to early Jesuits and fur traders, stories of a legendary flood of great magnitude and force in 1776, that wiped out the last vestiges of La Verendrye's abandoned Fort Rouge at the junction. This flood was followed by lesser floods in 1790 and 1809. In 1813, Lord Selkirk established the first settlement, a rough cluster of humble buildings within a stockade known as Fort Douglas, approximately one mile north of the junction, near the foot of present day George Avenue in Point Douglas. Early in December, 1825, a blizzard struck with devastating suddenness, with a recorded death toll of 33 and many stranded between Pembina and Red River until mid-February by a series of succeeding blizzards. Snow depths on the prairie were reported in excess of five feet where undisturbed. These conditions persisted and the stage was set for a major disaster. Water underneath the ice has raised it to the level of the spring flood of the previous year. The weather was cold and the rain kept up all day. The river rose four feet. A mixture of rain, sleet and snow added to the dampness. The weather became warmer and there was a rumble of thunder and rain showers. Still raining. The ice went out on the Assiniboine River. Company employees using company boats were busy helping settlers to higher ground and moving their stock and effects. Started to storm with thunder and lightning and a torrential downpour of rain. Most of the settlers had either moved or were moving to high ground near Sturgeon Creek (north of Grant Town, Cuthbert Grant's Metis settlement, near what is now Little Mountain Park). Settlers on the east bank fled to Pine Hill (now referred to as Birds Hill and a settlement then known as Roseneath). The water still rising, two foot rise in twenty-four hours. Another gale from the northwest lashed the flood water to a sullen anger and relentlessly the water continued to climb. The water's level declined two inches. The Hudson's Bay Co. people returned to the fort to find complete ruin. Hordes of mosquitoes made life miserable. During the summer of 1826 some two hundred and fifty settlers left the area, mainly members discharged from the Regiment des Meurons. Almost all of the floodwater was now contained within the river banks and the settlers were starting to rebuild. Governor George Simpson reported to the London Committee of the Hudson's Bay Co., "... to such an extent as to give the whole country as far as the eye could carry, the appearance of a lake, with the exception of a few elevated spots, several miles from each other, whither the settlers re-treated to save their lives and such of their property as could be transported thither." His journal identified two of the high points of ground as being near St. Andrews (sometimes referred to as "Pelican Ripple", "Grand Rapids" and later as the "Lister Rapids") and Sturgeon Creek (Grant Town - "Little Mountain"). The settlers returned to discover the total destruction of Fort Douglas, Fidler's Fort and considerable damage to the walls and foundations of (Upper) Fort Garry. The Hudson's Bay Co. made the decision to construct (Lower) Fort Garry three miles north of the Lister Rapids (near present day Lockport) in 1832. The administrative headquarters of the company were moved there until a new and much more substantial stone walled Upper Fort Garry was constructed in 1838, at which time the headquarters reverted to the Red River Settlement. River broke up, but many ice jams. Heavy rainfall causing rapid rise. Many moved from the Upper Church (St. John's) area. There is a vast lake from Fort Daer (Pembina, N.D.) to Red River (Settlement) about 22 miles wide. Water started seeping into the cemetery and churchyard of Upper Church. River rose seven feet during the night!! Bishop Anderson and his sister abandoned the Upper Church and fled to the "Little Mountain" area north of Sturgeon Creek where about 100 families had sought shelter. The Bishop and settlers remained there until early in June. Most of the settlers and Company (H.B.Co.) employees had returned to commence repairs and rebuilding of the settlement at the "forks". Property losses were estimated at 25,000 pounds sterling. A very significant amount for that time! The main effect of this flood was to accentuate migration of St. Andrews and Middle Church settlers to the Portage Plains, resulting in the establishment of three new parishes along the Assiniboine River; St. Mary's, St. Margaret's and St. Anne's. A period of nearly 100 years saw little flooding, with the exception of a minor inundation in 1861 for which there is little recorded information. However, while the area of land flooded was only in low-lying areas, the settlement had experienced additional growth particularly in the Kildonans and Middle Church (Frog Plain) districts, thus many more residences were affected. Areas in Point Douglas and along the Seine River (German Creek) suffered some damage. The years immediately following World War II witnessed a sudden explosion of residential and commercial building activity in Winnipeg, the population reached over 350,000 persons. Fall and winter of 1949 brought above average precipitation to the valley, resulting in deep frost penetration and a high water table. Late spring thaws and river ice breakup on the Red, Assiniboine, Seine and La Salle Rivers, continued rain, sleet and snow were a portent of serious consequences for the Red River Valley and Winnipeg. The Red River crested in mid-May of 1950 at 757.87 ft. above sea level at James Avenue, or approximately 12 ft. above initial flood stage, creating a lake 7 miles wide at the city's southern limits. In the built-up sections and core areas, over 10,500 homes were flooded, forcing evacuation of more than 100,000 residents of the city - nearly one third of the city population. To the south of Winnipeg a lake over 100 miles long and 25 miles wide had formed, flooding out thousands of farmsteads and towns in Manitoba, North Dakota and Minnesota - a disaster of major proportions! After the rivers had returned to their placid, meandering disposition late in May, estimates of flood damage exceeded $115,000,000. The cost in time, effort, anguish and suffering was incalculable. Only the spirit and persistence of Winnipeg citizens prevented utter catastrophe. The disastrous flood of 1950 prompted the Province of Manitoba to carry out cost-benefit and hydrological studies in the watersheds of the Red and Assiniboine Rivers to ameliorate or eliminate future flooding in southern Manitoba. The Red River Basin Investigation, a provincial and federal commission recommended a system of complementary flood control measures be under-taken; a primary and secondary diking system for Winnipeg, a major floodway diversion channel circumventing Winnipeg, the Shellmouth Reservoir on the upper Assiniboine River, the Portage diversion channel and a control structure on the Fairford River at an estimated total cost of $99,200,000, of which the Red River Floodway was estimated to cost $62,700,000. Despite much criticism, debate and heated opposition an agreement for cost sharing with the Government of Canada was signed and floodway construction commenced in October, 1962 - a credit to the determination and foresight of the government under the leadership of Premier Duff Roblin. One of the world's largest excavation projects was completed in March, 1968, and its benefits today require little explanation. To complement the floodway a total of 27 miles of dykes were constructed (3,000,000 cu. yds.) within the City of Winnipeg at a cost of $4,600,000. NOTE: City of Winnipeg datum - 727.57 Geodetic elevation (feet above sea level). Elevation at Portage Avenue at Main Street = approximately 760 ft. geodetic. Under the normal fall, summer and winter conditions, all the water in the Red River will continue through the City as in the past, in its natural bed. In the spring, especially at times of possible flood, as the water rises and flow reaches 30,000 cu. ft. per second, it will commence to naturally divide between the Floodway channel and the Red River. As the flow increases beyond this, the flood gates will be raised and artificial control of division established. At the design flood, the gates will be raised to maintain natural flood water levels upstream of the control structure, at which time 60,000 cu. ft. per second will be flowing into the diversion channel, 70,700 cu. ft. per second into the Red River channel, design level capacity of Winnipeg's dyking system. In spite of some flooding to the south of Winnipeg, including such areas as St. Norbert and St. Vital, little damage occurred from flooding in 1974 in Greater Winnipeg following the completion of the Red River Floodway and other flood control measures undertaken in the province. The dramatic difference in dimension of historical flooding is illustrated in the accompanying map. 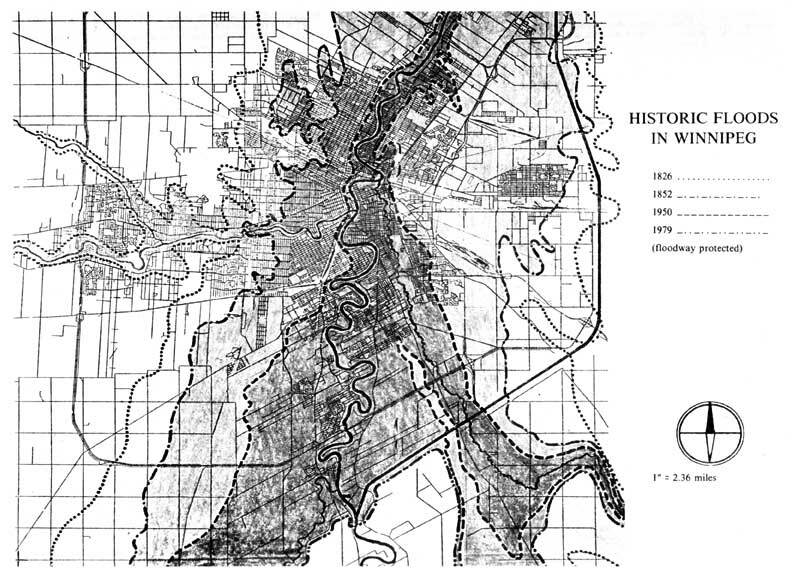 An approximated boundary outline in 1979 flooding in south Winnipeg is shown also. The Province of Manitoba and the Government of Canada in cooperation with the City of Winnipeg recently announced intention to investigate further flood control measures to reduce the impacts of future flooding in Southern Manitoba.